El Toro Bravo is proud of their staff, food and service they provide to the Zionsville area. 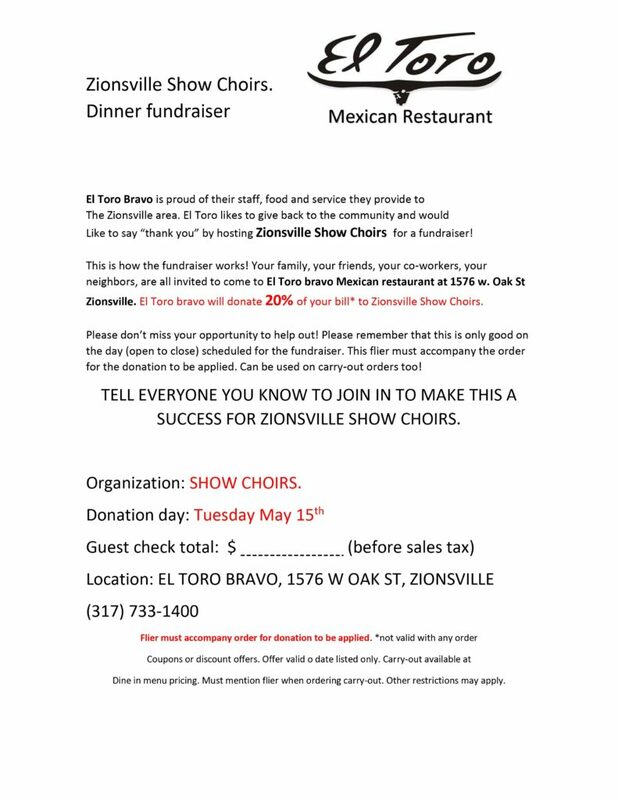 El Toro likes to give back to the community and would like to say “thank you” by hosting Zionsville Show Choirs for a fundraiser! This is how the fundraiser works! Your family, your friends, your co-workers, your neighbors, are all invited to come to El Toro Bravo Mexican restaurant at 1576 w. Oak St in Zionsville. El Toro will donate 20% of your bill* to Zionsville Show Choirs. Please don’t miss your opportunity to help out! Please remember that this is only good on the day (open to close) scheduled for the fundraiser. THE FLIER BELOW (click to link and print) must accompany the order for the donation to be applied. Can be used on carry-out orders too! 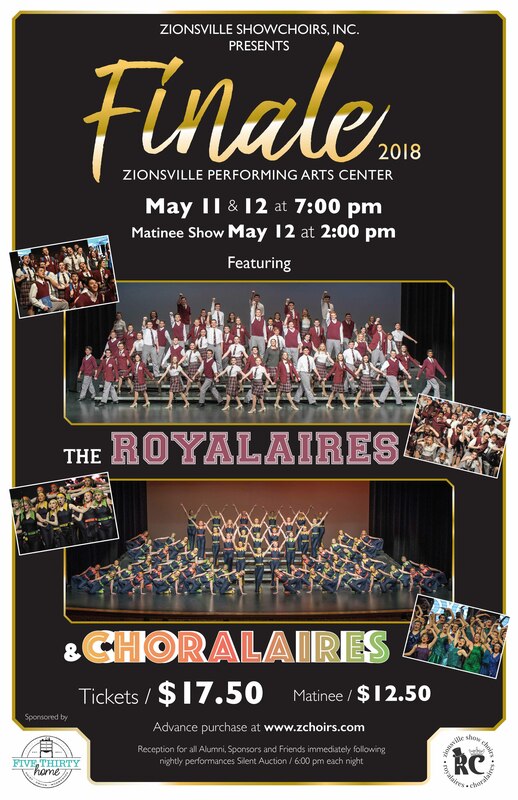 TELL EVERYONE YOU KNOW TO JOIN IN TO MAKE THIS A SUCCESS FOR Zionsville Show Choirs. Flier must accompany order for donation to be applied. *Not valid with any order coupons or discount offers. Offer valid on date listed only. Carry-out available at dine-in menu pricing. Must mention flier when ordering carry-out. Other restrictions may apply. If you would like to order anything for Finale, the items available are listed below. Please note that if you are ordering flowers, this form must be received no later than 6:00 p.m., on Monday April 30th 2018 so we may place our order with the florist at that time. Click HERE for a printable version. For a printable version of the End-of-Year Celebration Banquet form click HERE. For your convenience, you may order and pay for Finale commemorative items using this form. Checks are payable to ZSI and should accompany the form. (Please use an envelope.) These will be collected in a box in the Show Choir Rehearsal Room (room 71). You may also submit at Finale (if you’re not ordering flowers) or the end-of-year banquet. The yearbooks listed below have been developed from photos taken by our parent volunteers over the year. Samples will be available for preview at Finale. Books are expected in June. Zach Rosing beautifully records and edits Finale performance and provides presentation copies, delivered to students at school. Scott Clark’s photos of both ensembles have been used for canvasses available in two sizes. Here’s a link to the photos; see samples at Finale. Robert Goodman Jewelers has created beautiful, custom charms for Royalaires and Choralaires. They are perfect for necklaces, bracelets, or key rings. Limited Quantity Available. *If you are ordering flowers, this form must be RECEIVED no later than 6:00 p.m., Monday, April 30, 2018, so that we may place our order with the florist at that time. A limited number of additional bouquets will be available at Finale. Last day to submit is May 13 at End-of-Year Banquet. You will be notified about pick-up dates/times when ordered items have been received. Questions? 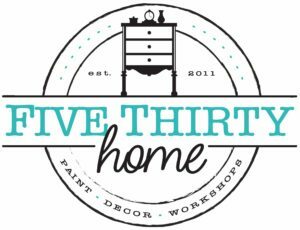 Call or text Amy Connelly, 317-627-0948.